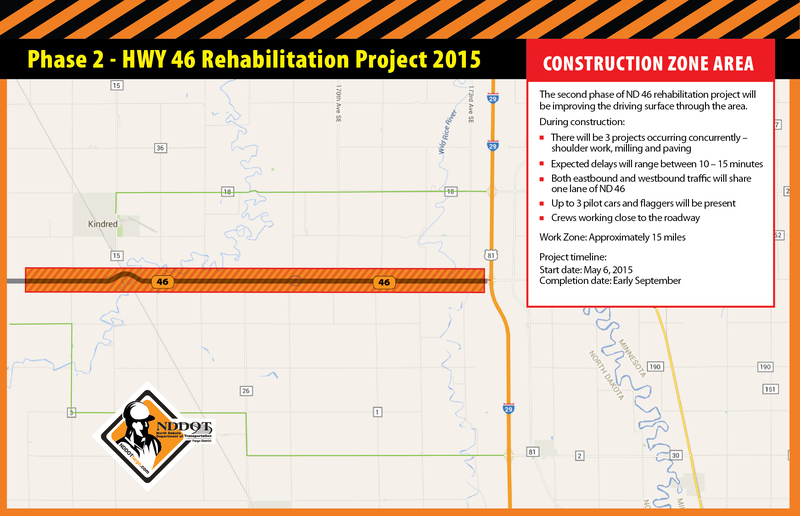 Project work started in early May on North Dakota Highway 46 (ND 46) near Kindred, ND. This phase is expected to be complete by September 2015, weather permitting. There will be three projects occurring concurrently – shoulder work, milling and paving – in this stretch. The work zone is approximately 15 miles, extending from State Highway 18 to County Highway 81. ND 46 rehabilitation project will be improving the driving surface through the area. This is the second phase of a three-year project to rehabilitate ND 46 from County Highway 81 to State Highway 32. In 2014, crews completed bridge work east of Kindred near the Sheyenne River, the Wild Rice River near I-29 and the Cass Coulee just east of the Wild Rice River as well as widened the roadway and added shoulders. The project is funded by 80% federal funds, and 20% state funds.